I really like the idea of unexpected guests dropping by unannounced. And of me throwing my hands into the air and thinking, whatever will I feed these rogue guests who didn't even give me enough time to bake them a cake? The unannounced guest. It's almost a cliche at this point, when you're trying to drive home the point that whatever you're describing is easy to make and will surely satisfy: "this is the perfect thing to have in your arsenal for the unexpected guest." But seriously. If you drop by unannounced, you're probably going to get a class of water and whatever fruit I happen to have lying around. Or we'll just go to that great little French place down the street and order crepes. Easy and sure to satisfy. But if you give me a little time, and perhaps hint that you'd like something sweet and blog-worthy (the blog-worthy part always gets me), then you might be lucky enough to get something like this. 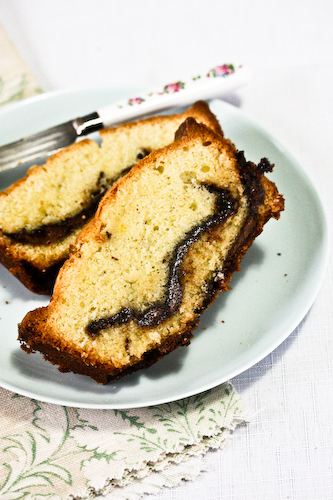 A luscious pound cake with a ribbon of Nutella running through, appearing when you slice it like the sly smile of someone who just shows up and expects cake. The nerve. 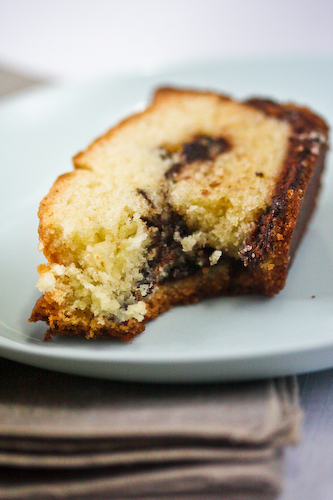 The recipe comes from Lauren Chattman's great little book "Cake Keeper Cakes" which specializes in the kinds of simple baked goods that can sit on your counter, under a glass cake keeper dome, waiting for people to pass by and sneak crumbs off the sides. 1 13oz jar Nutella, although you may not use quite all of it, I didn't. Not quite. Oven preheated to 325F. Grease or spray a 9x5" loaf pan (grease it well), sprinkle with a little flour and set aside. Lightly beat the eggs and vanilla together and set aside. In a medium bowl, whisk together the flour, baking powder and salt, and set that aside as well. In the bowl of your mixer (standing or hand-held), cream the butter and sugar on medium-high speed until pale and fluffy. This should take about 3 minutes. You'll probably need to scrape down the sides of the bowl a couple of times with a spatula. Turn the mixer to medium-low speed, then pour the egg mixture in, in a slow stream. Chattman recommends a glass measuring cup for this. Turn the mixer down once more to slow, and add the flour mixture about 1/2 cup at a time, scraping down the sides as necessary After the last addition, mix for 30 seconds more. This last step is important, as it gives a structure to the batter, which, I think, helps it to support the Nutella. Pour 1/3 of the batter into the prepared pan, smooth it out, then layer 1/2 of the Nutella on top of that. Pour another 1/3 of the batter over the Nutella, then the final layer of Nutella, and ending with the final 1/3 of the batter. Plunge a butter knife into the batter and run it through in order to create the swirl. Bake on the center wrack of the oven for about 1 hour and 15 minutes, until the cake is golden and it passes the toothpick test. Let it cool for about 15 minutes in the pan, then invert it twice (so that it's right side up) onto a wire wrack and let cool completely. NOTE: The bottom layer of the Nutella sank down into the crust, and from the picture in the book, and reviews of this recipe I've read, this is not an experience unique to me. I also don't think it's anything to worry about, but you've been warned. What a fabulous cake!! It sounds like a keeper for sure! I loved the "not at all difficult to make" on foodgawker. Made me come here quick! Hooray for nutella. I'm bookmarking you! I would be the person sneaking crumbs. For sure. Just bought this book - will try this soon, sounds fantastic. I thought the book is something that is worth buying. With a recipe like this inside, this must really be something!